SPRINGDALE – The iconic sign and monument at Zion National Park’s south entrance, a favorite photo opportunity for visitors from all over the world, is likely to get an overhaul soon. It is one of the many things the park is planning to help ease congestion caused by increased visitation. The monument’s current placement is too close to the roadway, Zion Public Information Officer John Marciano said. 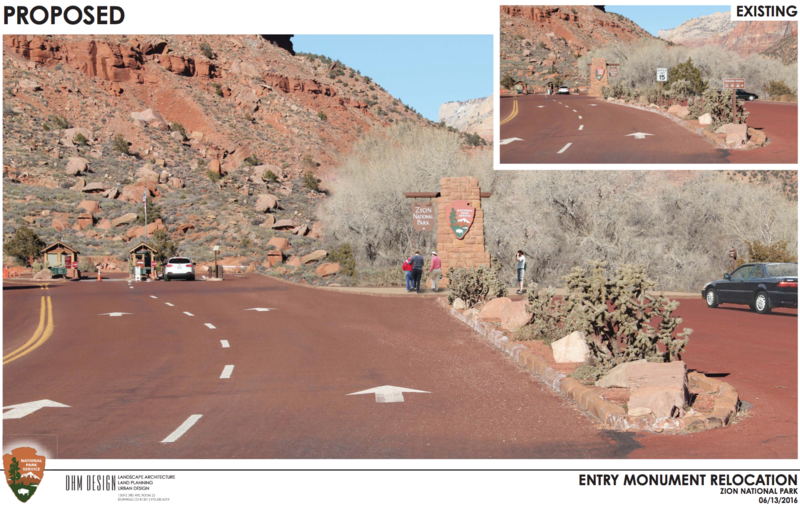 Zion is proposing to move the entrance monument, which is over 80 years old, approximately 28 feet east from its current location, construct a monument plaza surrounding it, and restructure the parking area next to it in order to provide additional space for vehicles entering the park. A simulation image of what the reconfiguration of the monument may look like is included with this report. “The existing parking area would be reconfigured to allow for a monument parking exit lane and parallel parking spaces bordering the pedestrian walkway,” the park’s planning page on the South Entrance configuration states. The project will also install a walkway on the eastern edge of the parking area and a seatwall, “which would help keep visitors from climbing on the monument structure and therefore protect the monument and further enhance visitor safety,” Marciano said. The monument itself would be reinforced by an underground concrete footing and the wooden pole and the sign would be reoriented “to reflect the historic arrangement,” the planning page states. In compliance with the National Environmental Policy Act, the park will prepare an environmental assessment that will evaluate potential issues and impacts to park resources the project might incur, especially since the monument is listed on the National Register of Historic Places. “It is necessary to make sure accurate studies are made, and all precautions are taken to mitigate any impacts on the proposed site change of the monument,” Marciano said. To reduce impacts on Zion’s traffic, the project would be done simultaneously with a larger Utah Department of Transportation reconstruction project along state Route 9. Marciano said the park hopes to have the monument reconfiguration done by Spring 2017. It is anticipated that the project, funded by visitor entrance fees, will take 60-90 days to complete once construction begins. As it has been doing with the Visitor Use Management Plan it’s currently formulating to address recent overcrowding issues, Zion is seeking public input regarding the monument reconfiguration. Interested parties can comment online or glean additional information on the proposed project by visiting Zion’s planning website. They can also comment through the U.S. mail by writing to: Superintendent, Attention: South Entrance Monument EA, Zion National Park, Springdale, UT 84767. Comments must be submitted by Dec. 28. This is absolutely fantastic news and I’m sure this will result in a positive reaction from the visitors and will help ease congestion and also improve safety for all those visiting. and I would like to thank all those involved in making this possible !